Strawberries and honey go hand-in-hand like bread and butter, but not just in a bowl! The combination of fresh or frozen strawberries and honey on the skin can have some major benefits, especially for those with oily and acne prone skin. Strawberries are a natural exfoliant and removes dead skin cells, therefore revealing baby smooth, glowing skin. Honey, on the other hand, is anti-bacterial and anti-septic aiding in the battle against acne, promoting health skin cell regenerating, and cleansing. This DIY strawberry honey face mask is very simple to make, but will yield some awesome results! Wash the strawberries and remove the stems. 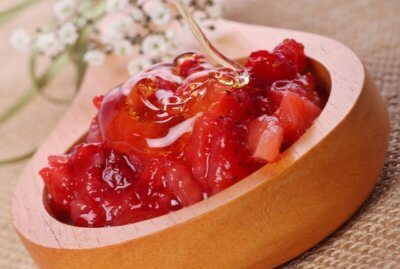 Use a fork to mash the strawberries or throw all ingredients in a food processor except for the sugar. Mix in sugar until well combined. Apply mask to clean skin and leave on for 10-15 minutes. Scrub the mask off in slow, circular motions and rinse with lukewarm water. Strawberries cleanse, exfoliate, and leave skin feeling super soft, while honey has anti-bacterial and anti-septic properties, and sugar gets out any dirt and sloughs off dead skin cells. Use 2-3 times a week for soft, glowing skin.